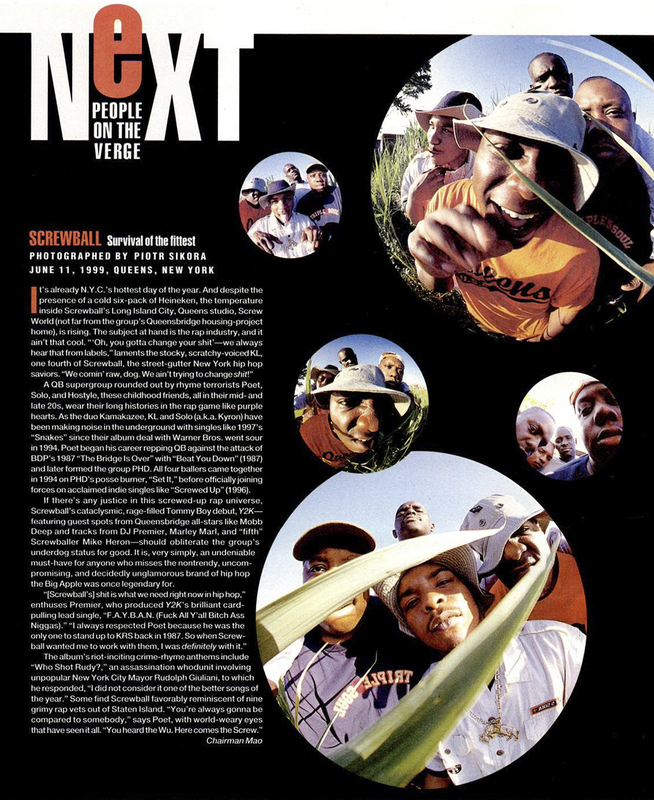 June 11, 1999 in Queens, New York: Screwball in the Next (People On The Verge) feature for the September '99 issue of Vibe Magazine. The group Screwball represented out of Queensbridge and included the OG, Blaq Poet, Hostyle, Solo (Kyron) and KL (R.I.P.). "As the duo Kamakazee, KL and Solo have been making noise in the underground with singles like 1997's 'Snakes,' since their album deal with Warner Bros. went sour in 1994. Poet began his career reppin' QB against the attack of BDP's 1987 'The Bridge Is Over' with 'Beat You Down' (1987) and later formed the group PHD. All four came together in 1994 on PHD's posse burner, 'Set It,' before officially joining forces on acclaimed indie singles like 'Screwed Up' (1996). Soon after, they'd release their Tommy Boy debut, 'Y2K,' which featured 'F.A.Y.B.A.N.' (produced by DJ Premier), 'You Love To Hear The Stories' with MC Shan, 'The Blocks' with Nature, and 'Who Shot Rudy' going at Rudy Guiliani. KL passed away back in 2008 and Blaq Poet's consistent work with DJ Premier has been very well-received by fans.